It was a day well spent for the women from Prakat who participated in the FLLN convention. eMERG is an association for women in technology, business, profession and services. It is a non-profit doing some fantastic work providing women a platform to showcase and develop their business and talents. FLLN is their flagship annual event, an international business convention where women participate to learn, grow, network and be part of mainstream business- the perfect place to be for current and future women entrepreneurs. Karnataka Chief Minister Siddaramaiah inaugurated the FLLN event, followed by panel discussions. Our first impression at the event was one of exuberance, looking at nearly 500 odd high-energy women entrepreneurs- all eager to learn and share. The talks motivated women to pursue their dream by reaching out to the right resources to conduct and establish business networks. They provided useful insights into government policies, initiatives around financial support and subsidies that encourage entrepreneurship among women. The panel discussions were thought provoking and the keynote address from Deepak Shinde, though short, was invigorating. 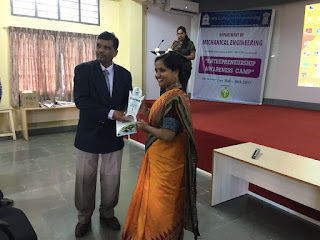 The ‘ sheforher ‘ online platform initiative from Indian Administrative Service (IAS) officer Mrs. K. Ratnaprabha and moral story from Deepak Shinde, of joining hands of dreamer and a supporter was well aligned to the eMERG purpose. eMERG regularly conducts training programs for the members, which provides opportunities to learn about the current policies, funding facilities as well as training potentials available from the government and the non- government sectors. eMERG organizes trade delegations nationally as well as internationally which provides excellent exposure opportunities.